The Mytholmroyd Net was maintained by Frances Robinson until the summer of 2013 when she had to stop for personal reasons. Throughout that time, Frances was asisted when needed by Pennine Pens who maintain the Hebden Bridge Web. Pennine Pens feel this remains a valuable resource for Mytholmroyd and has committed to keeping it online for another year or so. If anyone wishes to discuss its future, please contact Pennine Pens. Mytholmroyd Swimming Pool: Calderdale approves plans. If all goes as is hoped, swimmers will be able to enjoy a local pool by Spring 2014. More funds are still needed. Read more and how you can donate. Mytholmroyd Gala is a local annual community event. This year's event was on Saturday 29th June 2013. As well as the latest on Consultations, Police Update (PACT) for the area and Open Forum where residents can have their say on local issues. If you are unable to attend the meetings, you can log on and post your questions and comments to the Police, local Councillors & Council Officers. The online session will be live between 7:45 and 8:45 pm on the night. The new mayor of Hebden Royd Town Council is Mytholmroyd 's Karl Boggis. Karl was born in Hebden Bridge moving to Mytholmroyd when he was four years old. He attended Burnley Road and Calder High School. He is perhaps best known for having run the Bridge End chip shop in Mytholmroyd and for his service to Calder Valley Youth theatre, St Michael's Amateurs and Hebden Bridge Light Opera Society. He was elected for Caldene Ward in March 2008. Paralympian Karen Darke opens Highland cycling centre. 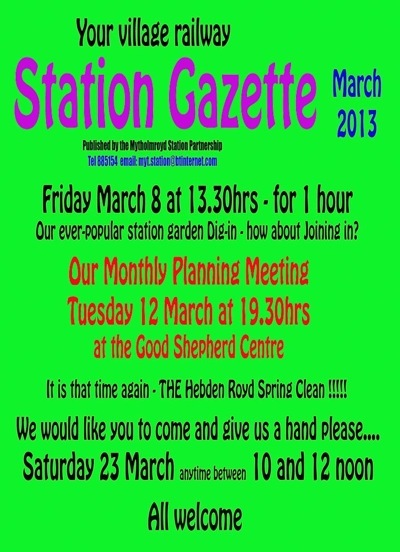 Snow stopped Play - the Annual Hebden Royd Spring Clean was postponed for a few weeks but what a difference the sunshine has made. Nearly thirty station volunteers from the Mytholmroyd Station Partnership - of all ages (4 to 74) made a magnificent improvement to the village railway station and surrounding area. 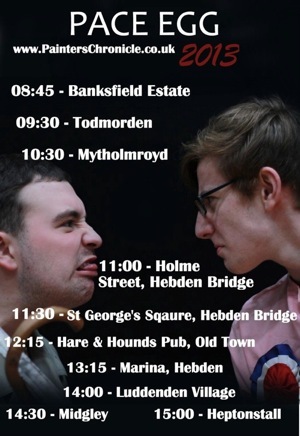 The Pace Eggers will be touring the area on Good Friday 29th March 2013. Watch them IN MYTHOLMROYD at 8.45 at Banksfield and 10.30 at St Michael's Church Square and the other venues on their poster on the left. SWIMMING POOL! After decades of campaigns, it looks like a swimming pool may finally be built in our area, possibly by Christmas. View plans on 27 March. The next Luddendenfoot Ward Forum and PACT meeting will be held at St Michael's Church, Mytholmroyd on Thursday 7th March 2013 - 6.15pm arrival for a 6.45pm start. Calderdale Council is holding a further series of Flood drop-in sessions where people will again have the opportunity to talk, face to face, with engineers who knew in great detail about the flooding, and where the council, Yorkshire Water, the Environment Agency and the Canal & River Trust will be available to explain what work has been done since last Summer, and what's also planned in the medium and long terms. The National Flood Forum will also be there with practical help and advice. Mytholmroyd (St Michael's Church Hall): Tuesday, 12th March, 3pm to 7pm. Burnley Road Academy helping the volunteers of the Station Partnership. 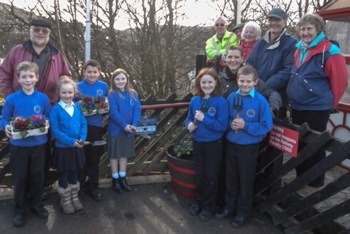 Photo: Burnley Road Academy pupils helping with spring flowers to greet visitors and residents to Mytholmroyd station. Following on from the highly successful and enjoyable Carol Sing on the Northern Rail trains this last December, the Burnley Road Academy decided to extend their support for the Mytholmroyd community by helping the volunteers of the Station Partnership. The Academy is making a valuable contribution towards enhancing the entrance to the village with floral displays at the station. Mrs Pam Savile, Head of Burnley Road Academy says "It's always a pleasure working with the Station Partnership as they are so supportive. We are involved in the Station Carols and the Art Work which the children love. We make good use of the train weekly to take classes swimming and for other local visits." The Liberal Democrats have sent the HebWeb a statement on the Hebden Royd Town Council budget, emphasising a wish for Mytholmroyd to break with Hebden Bridge. more info HERE. Petition objecting to Calder High becoming an Academy: if you wish to object to Calder High becoming an Academy the petition can be downloaded along with more information. HERE. A Dark Water - remembering Sylvia Plath in Hebden Bridge Rachel Pickering reflects on her brooding West Riding valley and how its two great poets might have fared in the town of today. Calling all (local) artists - This year it is the turn of Cragg Vale school artists to show what they can do with the station building displays. We are collating a superb collection of old photos - supplied by generous residents - for our every-popular History displays. 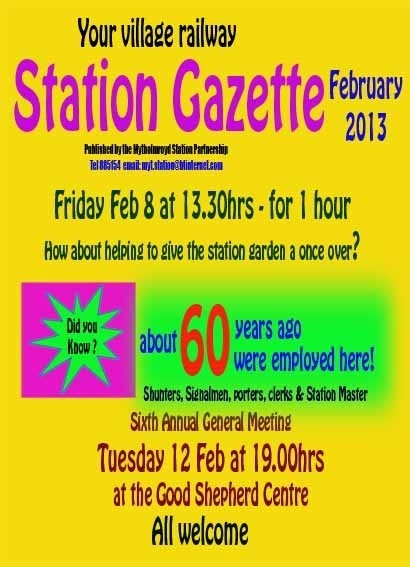 We have two (A2) poster frames on the old station building available for visual artwork by local residents.We are looking for local artists to use these spaces in 2013 - phone 885154 for details. 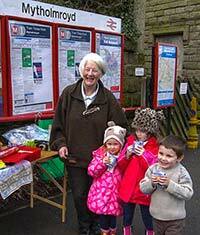 See Mytholmroyd Station website for more - HERE. Concerns over one of Calderale's biggest schools becoming a sponsored academy were voiced at a public meeting. Parents met to discuss the proposals involving Calder High School at a debate organised by Friends of Calder High held at Hebden Bridge Town Hall. We know that rising gas and electricity prices are a real concern. We have the power to reduce energy bills if we join together to look for a better deal. You have the power to save up to £250 on your electricity and gas bills! On 29 January an online energy auction will take place with UK energy providers. They will be offered the chance to supply people across Calderdale who have signed up to the scheme. The more households that sign up, the better deal we get for everyone. Just fill in one simple online form by following the weblink HERE and have a recent energy bill to hand so that we can estimate your annual energy use and spend. Or take your latest energy bills to your local library and ask about energy switching. Above: Jade Smith's amazing photo of Valley of Lights, Mytholmroyd. Click photo to enlarge. 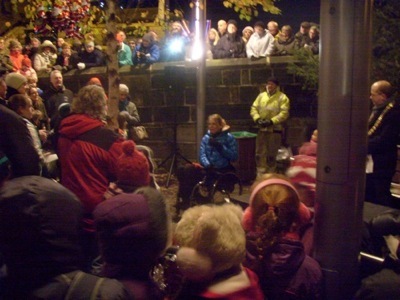 Karen Darke switching on the Christmas lights! Karen Darke silver medalist at the Paralympics this summer and gold medallist at the Para Tri-athlon World Championships in New zealand in the Autumn turned on Mytholmroyds Christmas lights at 17.00 in Mytholmroyd on Saturday 1st Dec.
See Hebweb for more and a photo of the silver postbox in Mytholmroyd to celebrate her achievements - HEBWEB. 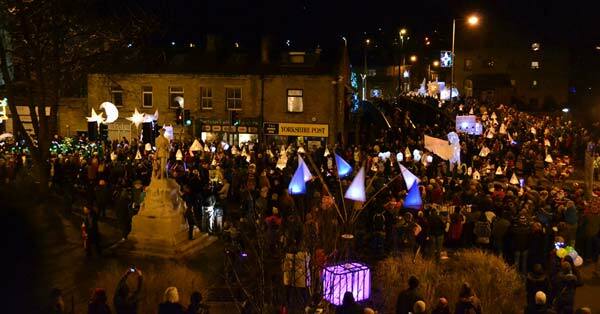 Hundreds of people descended on Mytholmroyd tonight for the switch on of the Christmas lights and the Valley of Lights Parade. VIDEO of the lights being switched on is HERE though we couldn't get close enough to film Karen due to the pure volume of people. We did manage to get some photo of Karen after fighting our way through the crowds and they can be seen at this Facebook Link together with some photos of the parade HERE. The Alice Longstaff Gallery Collection and the Hebden Bridge Literary and Scientific Society, Local History Section has kindly made available to the Mytholmroyd Net a selection of old photographs relevant to Mytholmroyd. Above left is from the 1914 Mytholmroyd Charity Demonstration - the forerunner of the Mytholmroyd Gala. Above right is Caldene Bridge. 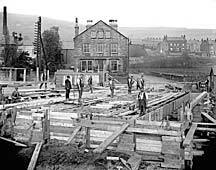 See more old Photos - of Mytholmroyd - The Royal Oak when it was thriving, floods, procession through Mytholmroyd and Burnley Road with tram. Have enjoyed your collection of older pictures on the website. My brother and I were perusing them last week and were surprised that we knew several people. We both went to Calder High School 1951 to 1956. I have lived in Canada since '56 and my brother now lives in California. So, thought you might be interested in this picture taken at Calder High about 1952 or 53. 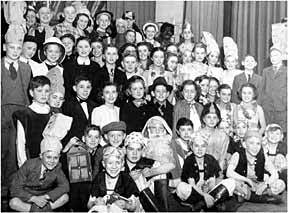 The cast of a school play, which as I recall wasn't very good, even though I was in it! I know names of about half the people and would be interested in hearing from anyone who recognizes him or herself.